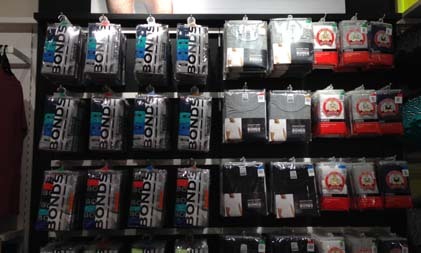 Design agency JKR Global has redesigned the packaging for Australian underwear brand Bonds. The new design is said to take Bonds back to its roots, building on the foundations of a very strong and recognisable logo. The overhaul, conducted for Pacific Brands Underwear Group in Australia, was led by JKR Singapore. The redesign covers all Bonds products including Wondersuit, an iconic product for the brand. “The Bonds brand is amazing, but its packaging simply wasn’t living up to the brand spirit and vision. Our task was to give this incredible brand an on-shelf identity deserving of a market leader, giving it back its confidence and charisma”, Emily Kousah, managing director of JKR Singapore said. “We then set out to totally reverse how it was applied on pack – from a manufacturer’s endorsement to charismatic brand icon. The challenge was then to nuance the visual identity enough to differentiate between the ranges, whilst keeping every product feeling absolutely like Bonds,” she added. The campaign consists of nine short situation-based "web-isodes" directed by Adam Wong Sau-Ping, and was launched on digital platf..
Balakrishnan had also been with GroupM's Maxus as managing director for four years prior to the merger. ..